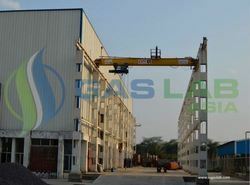 As a part of its commitment towards continual improvement and technical excellence GASLAB has an in-house R & D facility to study gas processes, collaborating with many Indian and International research institutes to research and develop existing and new processes. Especially close to our heart, research on Carbon capture and CO2 Sequestration is actively being pursued in the in-house R&D Centre. GASLAB recently showcased its first CO2 sequestration technology in 2014. (Patent applied for). GASLAB has everything from a well-equipped production unit to skilled professionals that enable us to manufacture and supply the best quality products. We have a team of highly qualified professionals that work round the clock to stand apart in terms of quality. Under the supervision of high-qualified technocrats and skilled management, we are poised to grow in leaps and bound. 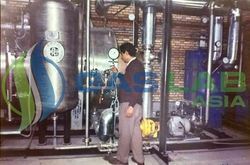 GASLAB also takes up revamping of older plants and suggests preventive measures in addition to supplying the skilled workforce consisting of chemists, operators and engineers etc. to run CO2 plants and gas extraction plants.Cryostar Tanks and Vessels, a sister company of GAS LAB has a modern, comprehensive and fully equipped fabrication facility which provides complete solutions in design, manufacture/fabrication, supply, erection and commissioning of critical process equipment and machinery used in oil and gas, refinery, petrochemicals, fertilizers, industrial gas units and other allied industries. It has approvals from The Chief Controller of Explosives, Petroleum and Explosives Safety Organization (PESO), Nagpur (India) for the manufacture of pressure vessels and cryogenic vessels as per SMPV rules and The Directorate of Boilers, for the manufacture of boiler and boiler parts as per Indian Boilers Regulations (IBR), U- Stamped and R- Stamped for pressure vessels.